Greg Damerow is an honest-talking guy from Ohio who went from working at a plumbing company to becoming a competitive hand cycler, most recently winning two medals at the USA Cycling Para-Cycling Nationals in Augusta, Ga.
Hand cycling is Damerow’s sport of choice after losing his ability to walk at age 18 due to a debilitating form of arthritis. Hand cycles are three-wheeled bikes powered by the arms, not legs, and require immense upper body strength. Knees are tucked under the bike. Not content with the current design of hand cycles on the market for disabled athletes, Damerow took it upon himself to start a company, Personalized Cycling Alternatives, to build adaptive bikes, working out of his garage in Richmond Hill, Ohio. He builds custom hand cycles for anyone who orders one, at a cost of about $2,000 for an entry-level, recreational hand cycle and $3,000 and more for a racing bike. When he’s not welding and painting in his garage, Damerow is training for races — cycling three times a week and swimming twice a week. Damerow is also enjoying a stint of publicity – and a nice business boost – after winning The Hartford’s Achieve without Limits contest. He was awarded $10,000 for his innovation and commitment in helping people with disabilities succeed, and used the money to upgrade the equipment in his shop. In August he’ll head to London and celebrate the kickoff of the 2012 Paralympic Games, also courtesy of The Hartford. The Hartford, a founding partner of U.S. Paralympics, launched the Achieve Without Limits Campaign in March 2011 to give people with disabilities and others the opportunity to engage with elite U.S. Paralympic athletes and be inspired by their stories. In addition to the cash award and Paralympics trip, Damerow also was paired with Brent Rasmussen, a Paralympic athlete on the U.S. Men’s Sitting Volleyball Team, to help put his business plan into action. Now 38 years old, Damerow recalls finding out about his arthritic condition – known as ankylosing spondylitis — at age 18, and being bedridden for two years. He had to learn how to walk again after losing function in his hips and spine, and as he gained strength, he also developed a Christian outlook on his disability: “Rather than question ‘Why me’, the question was, ‘What is God trying to teach me?’” he says. Damerow was working as a plumber’s assistant and a salesman in Virginia when saw a video of someone hand cycling and a new hobby was born. Soon he was dreaming bigger, looking to compete in a sport that six months earlier, he knew nothing about. Personalized Cycling Alternatives is a niche business, but Damerow says he has an edge over the competition on both price and design. While it can take anywhere from three weeks to a month to build a bike, “I only build what’s ordered, and everything is custom, which doesn’t exist anywhere else,” he says. In 2016, he hopes to go to the Paralympic Games in Rio De Janeiro, not as an observer, but as a competitor. 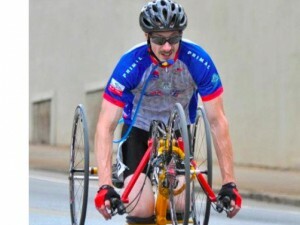 He’ll continue to share his personal experiences of using his handcycles in competitions and time trials on Facebook. Incredible! Greg wins! Arthritis looses. Thank you for being an inspiration.